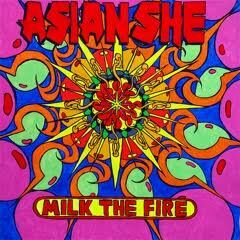 Los Angeles based Asian She have released their debut album ‘Milk The Fire’. Consisting of Noah Lebenzon (12 rounds) & Thomas Froggatt (She Wants Revenge) with help from David Brotherton on drums, this duo have crafted a refreshing album which manages the feat of sounding entirely fresh and cozily familiar at the same time. Tracked at Lebenzon’s home in Studio City with drums recorded at indie-rock stalwart Manny Nieto’s in Lincoln Heights, the album blends feel good rhythms, hard hitting drums and the most tasteful guitars with flourishes of keyboards, and live horns . With an influence that sometimes harks back to a couple of decades ago, with flourishes of indie in some of the songs, each track weaves an intricate sound, changing in pace and tempo throughout to make it a strong debut album.